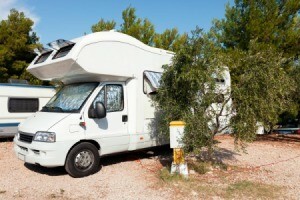 Rodents are attracted to human living quarters even when they are mobile. This guide is about keeping mice out of a camper. My 5th wheel camper has been at a camp ground since Aug. 2009. I have never had a problem with mice and have had my camper for 3 years 8 months. My husband came home Dec. 23rd and went back to the camper after New Years. He had food on the stove for dinner and found a mouse eating out of the pan. The camper was left clean, no dishes or anything out of place. He noticed sunflower seeds in the stove top and the bed had droppings on it. Nobody had eaten in the bed. He does have a bag of sunflower seeds. My cable wire is running through my window and my cooking vent was left open for when you cook. I am very scared of mice. I was suppose to go there, but now I don't want to because I am afraid of mice. How can they be in the camper now, when I have never had this happen before. My camper is parked against a hug tree and it leans over the whole top of my camper. I feel one of the things has to be how it got in. He placed a trap under the stove top and did kill one mouse, but I'm still not relieved that it is resolved. Mice, rats and cat all hate peppermint. By putting peppermint oil on a cotton ball and then putting it in cabinets and/or any way you want to. The peppermint oil kept them out of my house (I live in the middle of a large field) when we were redoing our kitchen. You have to change the dryer sheets every few weeks or they won't work. they seem to work good for me, except one year we got a weasel living in the camper. did some major damage. I hate mice and have had problems with them in three of my campers. I fight them with a vengeance, but just to be clear, nothing makes the problem go away permanently. It is a constant battle. We store our camper under a shed near a wooded area. Not a smart choice, but it is our only option. That compounds the problem because there is a never ending supply of mice. My new "used" fifth wheel had a serious infestation, so I began the process of ridding it of the heinous varmints. I started by cleaning out all the existing droppings and damage (wooden spoons chewed to shreds, etc.) so I can tell if I am making progress. Next I purchased 3 packages of Fresh Cab at my local farm and home store. Each package has 4 packets. I have read many blogs that say they work and many that say don't bother, but my infestation was so bad I was willing to try anything. I scattered the packets under cabinets, in corners, by the front door that has a pretty big unsealed area at the bottom and under the bed. I also sprayed Repels All heavily around anything that touched the ground on the outside of the camper. Repels All has a predator urine and smells pretty bad so using it inside is not possible. Next, I also set traps baited simply with bread. I waited and checked. First day, nothing. Second day two trapped mice, next day nothing, Third day one mouse. Then for three days I have had no trapped mice. I check daily, clean any droppings I find and hope for the best. We recently had torrential rains so I treated the outside heavily with Repels All again. My next step will be to start trying to locate any holes where mice can enter. In addition to spray foam with pest repellent, I will also stuff each hole with steel wool. That has kept mice out of my house for 20 years. (I am keeping my fingers crossed that it continues.) I also used this method on an apartment we built in our horse barn-a haven for mice. I stuff steel wool around ever opening under the kitchen sink and bathroom sink. I packed it under the baseboard molding and under the shower where it didn't fit snuggly to the floor. Mice can enter through an incredibly tiny opening. So far, not a mouse has gotten in. I strongly advocate steel wool. I will report back on my success or failure. Field mice keep getting into our trailer/camper when not in use and making a terrible mess. Any suggestions of how I can get rid of them? Thank you! I guess everyone is fearful of something. Me,I'm petrified of mice and rats. Awhile back someone on here posted"use peppermint oil". Since putting peppermint oil on cotton balls in several locations I have had no more mice! I still leave a trap or two but nothing in over a year. The only way we kept our camper on the farm free of mice was to park it near the bale house where our outdoor cats lived. I rely on cats to get rid of mice. Nothing else is as efficient. I stuff mouse holes with dryer sheets, new or used and that has repelled mice in my shed for years. I have also stuffed dryer sheets around a too-large hole for indoor plumbing in my upstairs bath, no more mice! Peppermint is supposed to work, I have always had good luck with the de-con pellet trays, and stuffing holes with steel wool, sos pads, or aluminum foil. Just know that those radar things you plug in don't work. I have actually seen a mouse sit right next to one of those and not move. We have had 2 pop up campers in the past 3-4 years, both given to us by my brother-in-law. Every time we store them for the winter and open them up the next year they have been damaged by mice. Somehow they get underneath the camper, climb in and basically chew the canvas up and make holes in it. The bed cushions are fine. It's just the canvas that has holes in it. Is there something we can use when we store it for the winter to keep the mice out? Any suggestions would help. I have always put dryer sheets around the inside of our camping trailer. In the cupboards and storage areas, everywhere. Mice seem to dislike dryer sheets. We have never had any signs of mice. A bonus is your camper smells good when you reopen it. When we lived on a grain farm, and parked the camper far from the house, mice invaded it. We had at least a dozen outdoor cats, and when we parked the camper close to the house where the cats hung out, we never had any trouble with mice. The cats did their job. One thing NOT to use is moth balls. The smell will permeate the space, and is far worse than mouse damage. We recently purchased a 30 foot camper and I found mouse droppings in the floor vents and cupboards. Everything is sealed up tight under the camper so mice shouldn't be able to get in anymore. I heard that certain dryer sheets help repel mice. Is that true? Does is have to be a certain brand (Downy or Bounce or generic store brand) or scent? Any info would be appreciated! Essential oils such as peppermint, mothballs, ammonia and onion have been known to drive mice away. Some people even say fox urine will send your mice packing, because the fox is a natural predator of mice. Peppermint oil sure sounds more pleasing to the other residents of the apartment; you! I found what I think is the main access to my trailer for the mice. The general approach seems to be trying to keep them out of the cupboards, etc., but I think what I need to do is try and keep them out of the floor and walls and then living spaces won't be an issue. Easier said than done? I am soon to find out. Under my shower is a big square hole which leads directly to the insulation between the floor and that stupid cloth under the trailer. There are holes in this cloth and I can see mouse poop in there as well as insulation that is probably being pulled out of the walls and other parts of the floor as this area seems very "full". I believe this is the nest. I've tried them all; peppermint oil, moth balls, steel wool sprayed with Lysol, and more. Nothing has really worked for the long haul.